April 22, 2015  Posted by . Over the weekend, I got the chance to chow down at our second Supper Club event featuring Chef Chuck Valla. The venue at 201 Allen Street with its large open commercial kitchen and intimate dining room is a perfect spot for our hungry diners to interact with the chef and taste his delicious creations. 1st Course – Rice Sausage – Grilled Thai style sausage filled with Jasmine rice, minced pork, garlic, and Thai pepper. 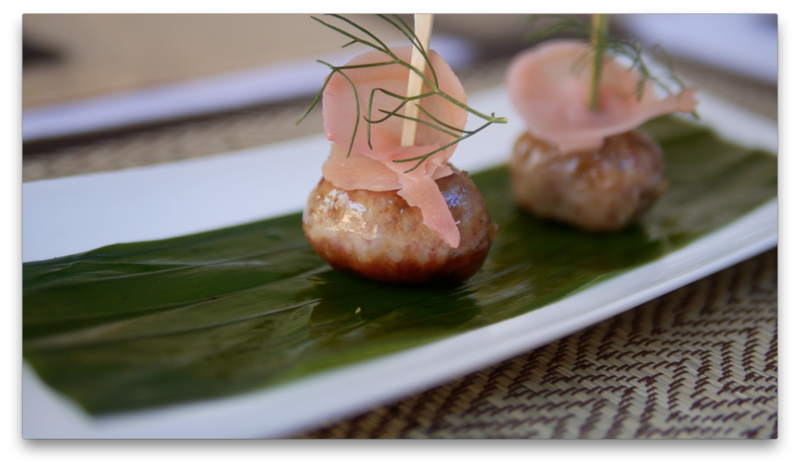 For the first course Chef Chuck Valla prepared his signature homemade Rice Sausage. Super rich in flavor, yet light, with a sweeter taste than Kielbasa, you can see the bits of rice embedded inside the casing. It was a delicious appetizer. 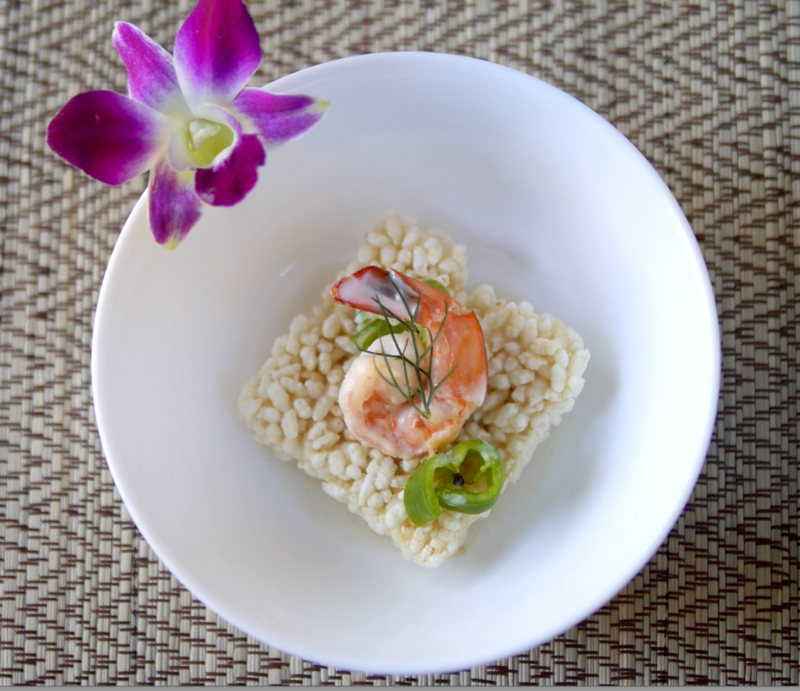 2nd Course – Khao Tung Goong – Crispy white rice, grilled shrimp with lemongrass Thai herbs infused coconut milk. 3rd Course – Nam Prik Pla Too – Grilled sticky rice, Thai mackerel, roasted long hot chili, garlic, and onion. 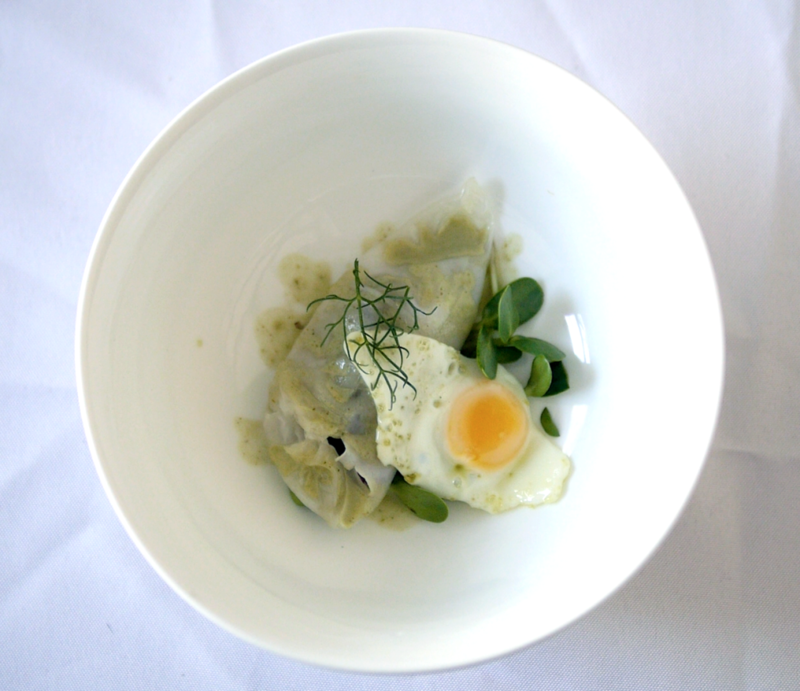 4th Course – Pak Mor Kang Keaw – Braised beef cooked in fresh rice paper, homemade green curry sauce, fried quail egg. A huge highlight was the Pak Mor Kang Keaw served as the fourth course. 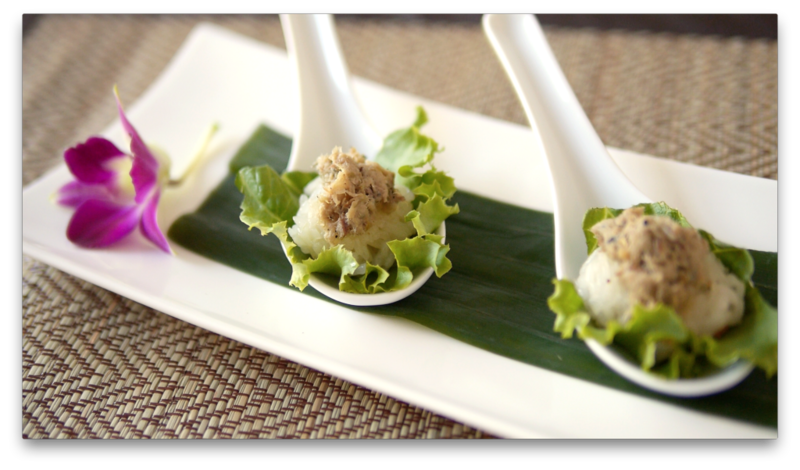 Beautiful and delicate in its presentation, the rice paper filled with braised beef looks as delicious as it tastes. The rice paper was delicate but with a spoonful of homemade green curry sauce and perfectly cooked quail egg placed on top the dish had a wholesome feel to it. It was a crowd favorite with a few diners requesting seconds! 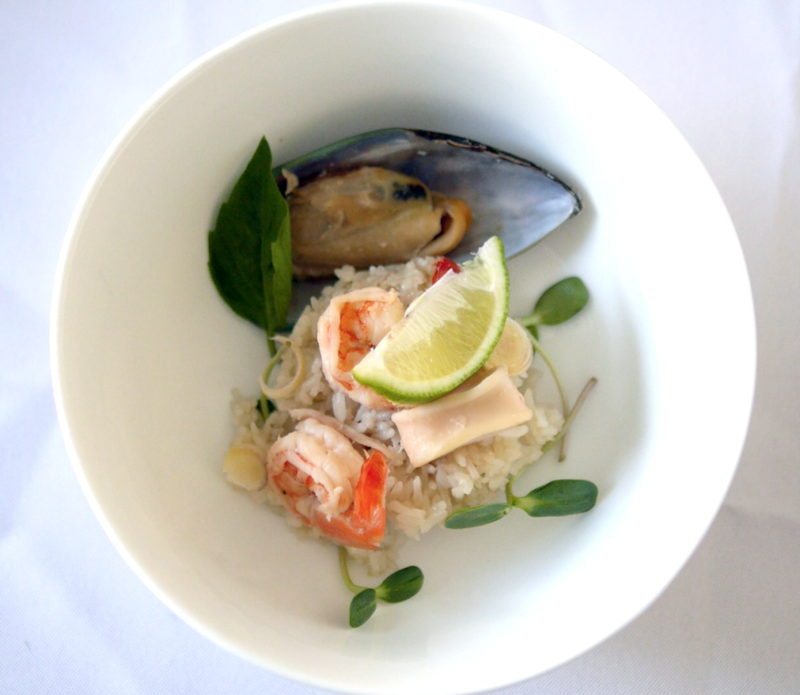 5th Course – Khao Ob Talay – Baked rice in Tom Yum broth, mixed seafood, Thai herbs. The Khao Ob Talay was very filling as I quickly scooped up as much Tom Yum mixture into the rice as I could with the New Zealand mussel. The rice was also presented at the perfect temperature. It was moist but had a harden edge for a scrumptious bite. The tasting menu was finished off with a purple lychee rice pudding for dessert and the sweetness hit all the right spots. Chef Chuck’s friendly presence and warm welcome only added to atmosphere. With my taste buds hitting all the right notes, I can’t wait for our next Supper Club! April 15, 2015  Posted by Cat L.
Meet our next Thaithentic Supper Club chef, Chef Chuck Valla. 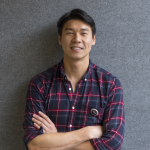 This special event aims to provide an experience celebrating both the taste of authentic Thai food and the knowledge behind real Thai ingredients. Chef has picked rice as the main ingredient for his menu and he is planning on cooking it six ways to demonstrate its versatility. He has picked two staples, Thai jasmine rice and sticky rice for the occasion. Why did you pick rice? I’m very excited about representing rice because in Thailand we eat it from breakfast to dinner. Most people think that rice is just a side dish, but to me it is the star. What is the biggest mistake restaurants make when cooking Thai food? The biggest mistake that Thai restaurants make is that they try to please non-Thais and try to make people love Thai food by serving something they are familiar with. For example, they make pad thai sweet, but in Thailand we don’t eat it sweet. What are the mistakes that home cooks make when cooking Thai food? People cooking at home usually make the mistake of using what they have in their pantry. It isn’t a mistake to be creative with what you have, but the ingredients are very important to making an authentic Thai dish. How important is rice in Thai cuisine? It is the most important ingredient in Thai food. We don’t eat curry without rice, but people do it here. You won’t have the right taste of the curry if you don’t have the rice too. Rice is the balance. Rice is the most important part of your meal. It’s not a meal without rice. What are some struggles in cooking Thai food in America? The different cookware I have to use can be difficult. I am a personal chef and there are so many times when I have to use a weird cookware. One time I made curry in a baking tray, but I see this as a good challenge for me. Is finding ingredients for a Thai meal difficult in America? I am lucky because I live in New York City and we have almost everything here. There are some ingredients like Thai chili that I have to substitute with Chinese or Mexican chilies, which does make a difference in the dish. What makes Thai Rice so special? Jasmine rice is not broken rice, it has a long grain and has its own aroma—even when it’s raw you can smell it. It doesn’t smell exactly like jasmine but it definitely has a floral note. Chef Chuck is putting a spin on classics like khao tung (deep fried rice snacks) and serving it with grilled shrimp and a dressing of yellow bean, lemongrass and coconut milk. Other dishes to look forward to include what chef calls a “Thai Jambalaya.” Using similar ingredients as what goes into making tom yum soup, chef will slowly cook jasmine rice, letting it absorb all the flavors. 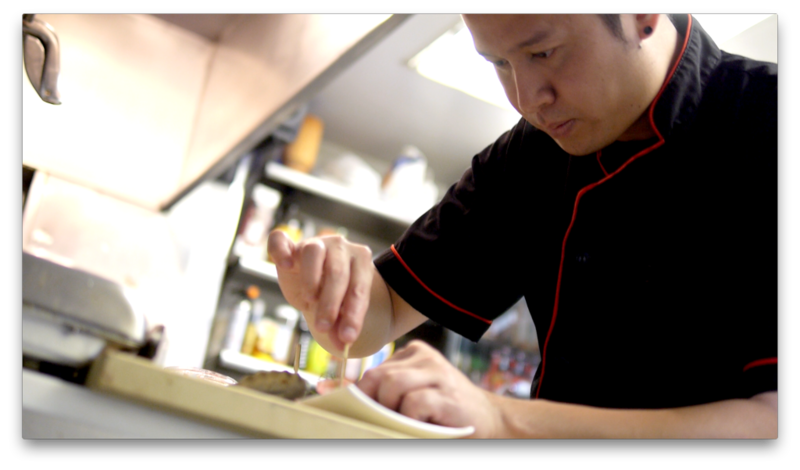 The main goal for chef is for people to eat the food that Thai people eat, while also looking at Thai food in a different way. “Everything that I am cooking is authentic. This is Thai food by a Thai chef presented in a unique way.” He said. 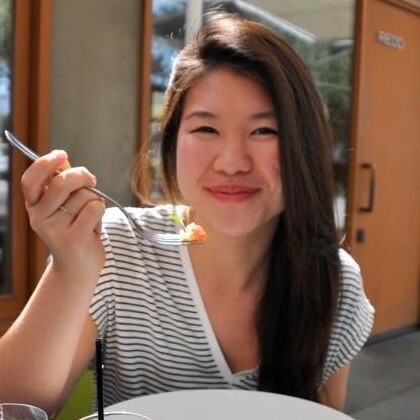 Cat Lau is a food writer and author of blog Fat Cat Eats. She was born and raised in Bangkok and studied Journalism and Anthropology at Boston University. She will be attending cooking school in Paris next year.